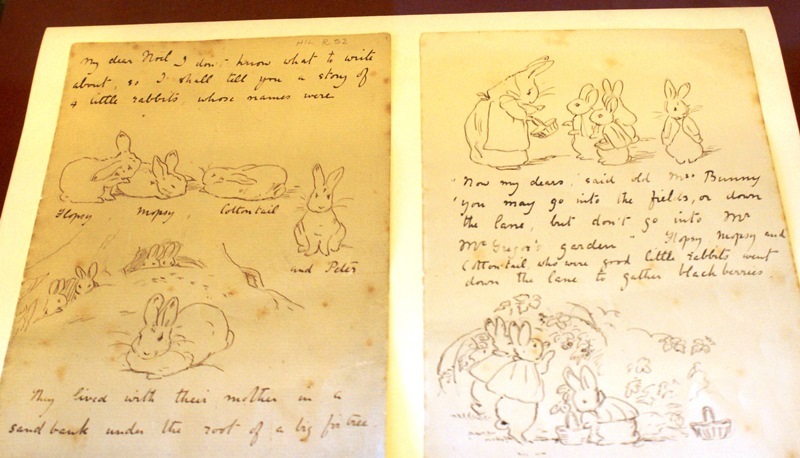 What struck me most was the foresight Beatrix Potter had to make a copy of this letter and use it as the basis of The Tale of Peter Rabbit, her first children’s story book. She was a multi-faceted woman of many talents which are showcased in an exhibition called ‘The Right Sort of Woman‘. The title for the exhibition comes from a letter Beatrix wrote to The Times in 1916 on the subject of Women on the Land. She wrote of her determination to employ the right sort of woman to work on her farms and also of the value and role of women in rural communities. 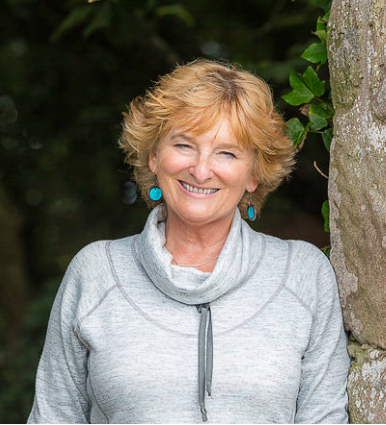 The exhibition uses artworks, letters, photos and everyday objects to tell stories of her work as a farmer, sheep breeder, conservationist, landlady, business woman and entrepreneur. 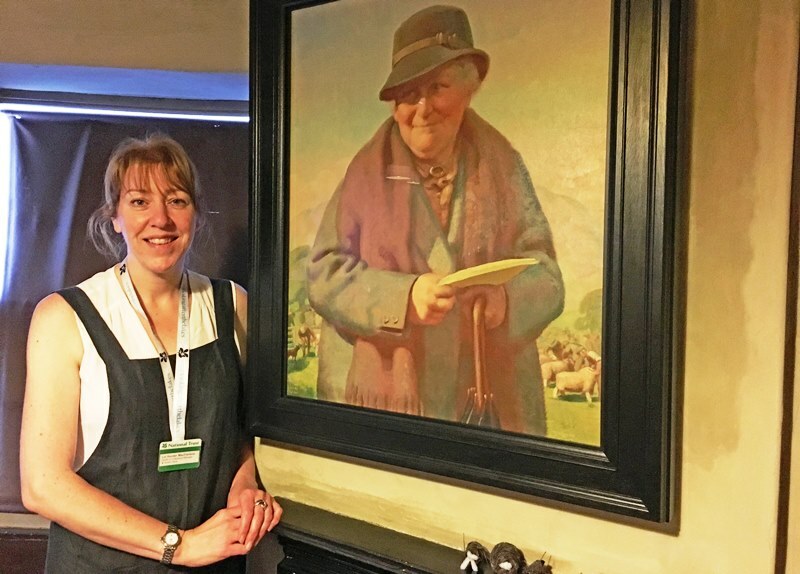 I was shown round by Liz Hunter MacFarlane, House and Collections Manager for the National Trust Beatrix Potter’s places. She knows just about everything there is to know about Beatrix Potter and is clearly a big fan. 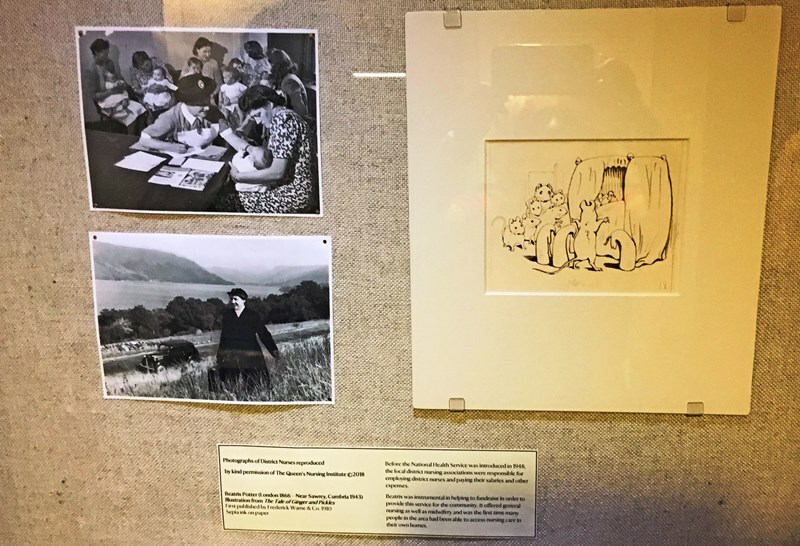 ‘Beatrix Potter was a very clever woman with strong views about what should happen in her beloved part of Lakeland.’ She moved here from London, having come on holiday for many years. She married William Heelis and quickly settled into her role as champion of the Herdwick breed, buying land and farms to save for posterity, dealing with her tenants in a firm but fair manner. She even helped set up the first District Nursing service in south Lake District. 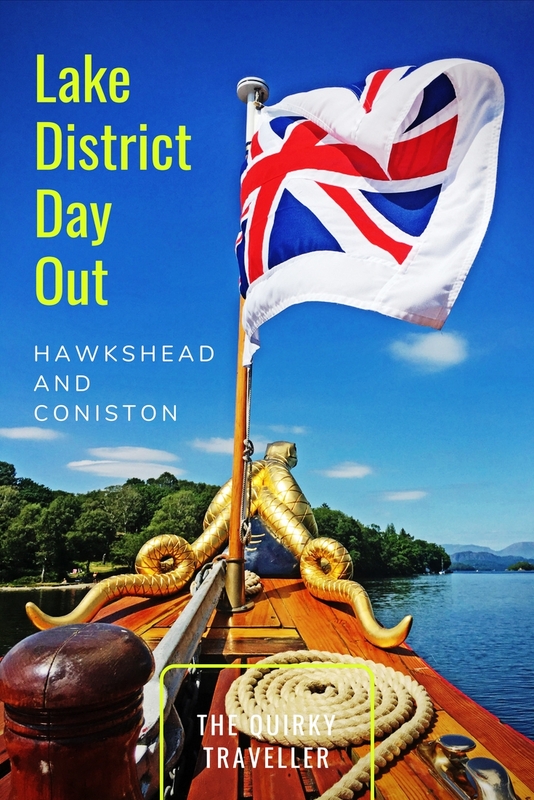 I took my time looking at the exhibits and absorbing as much information as possible before emerging into Hawkshead, glowing in the summer sunshine. It’s one of the Lake District’s most popular villages and attracts visitors from around the world. I popped into one of my favourite shops, Hawkshead Relish (I can highly recommend their Black Garlic Ketchup) and then walked back to my car, past Hawkshead Grammar School, where poet William Wordsworth was educated. Next stop on my day out in south Lakeland was Coniston, about 20 minute’s drive from here. Coniston is another popular touritst destination and on this sunny day the village was buzzing. Tables were full outside The Black Bull and the shops were doing a brisk trade in souvenirs, walking gear and ice-creams. I headed down to Coniston Water and went into the Bluebird Cafe to get some lunch. As I was enjoying a tasty bowl of vegetable soup, I heard a sonorous toot and saw an impressive boat gliding gently towards the jetty. 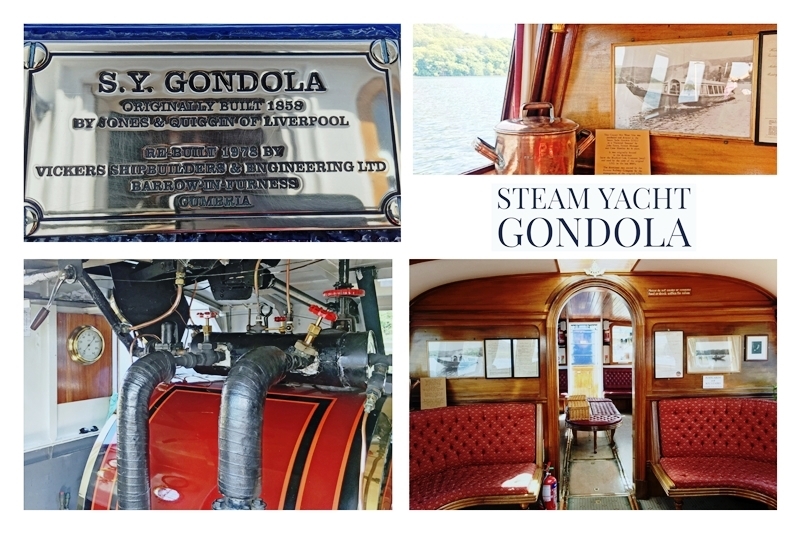 Steam Yacht Gondola is the most beautiful of all public vessels sailing in the Lake District. 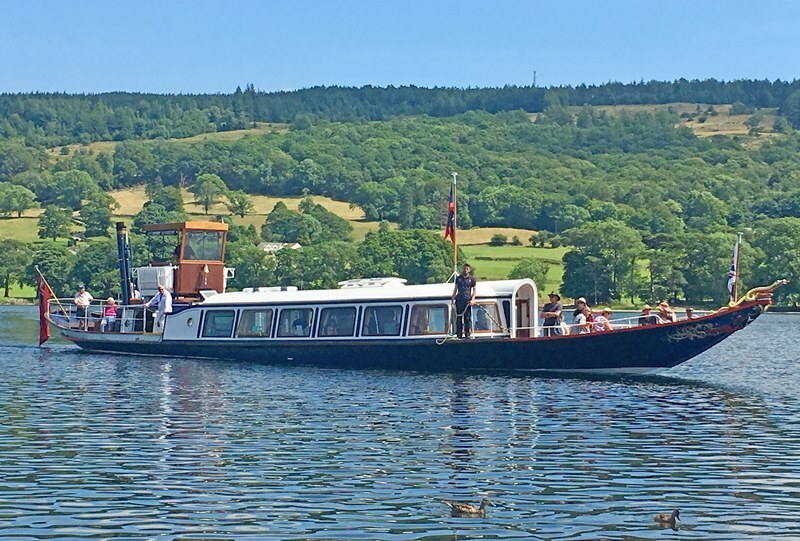 Operated by the National Trust, she sails daily from March to October, ferrying passengers in luxurious style around the lake. 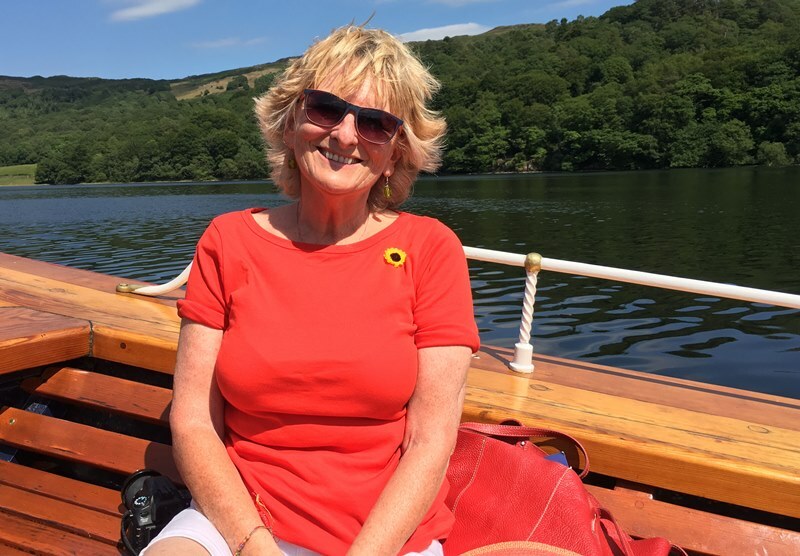 I joined her for the Full Lake Cruise which takes almost 2 hours to complete a leisurely circuit of Coniston Water. 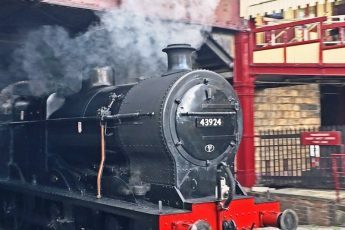 There are other options, including Walkers Cruises, Picnic Cruises and the Steam Footplate Experience. Check the website for more details. 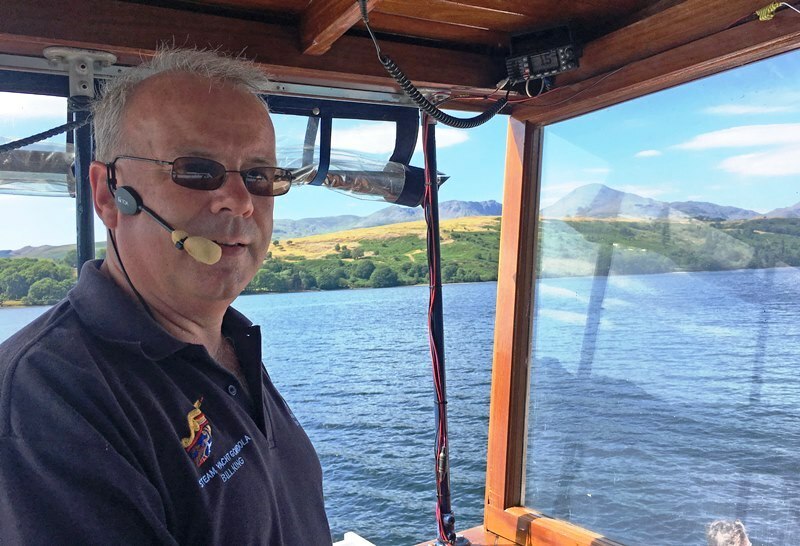 Captain Bill King gave a commentary on the history of Steam Yacht Gondola and Coniston Water. 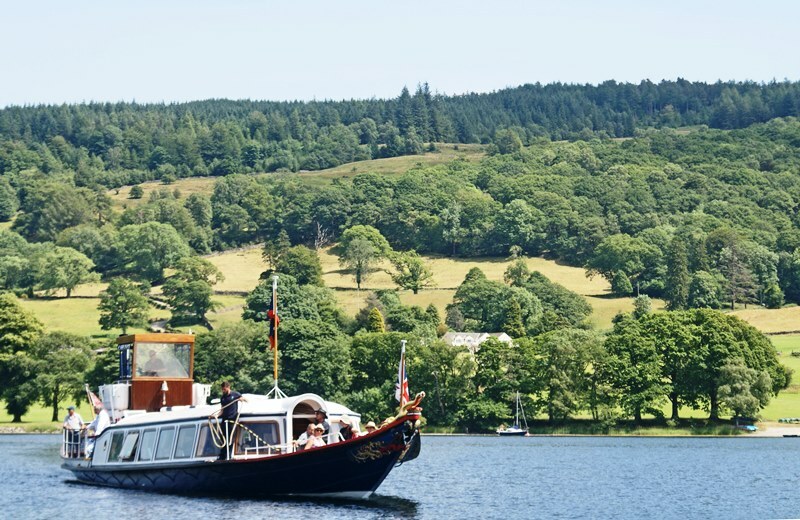 Launched in 1859, SY Gondola was originally built to transport passengers from the Furness Railway and the Coniston Railway to enjoy the lake. She retired from commercial use in the 1930s and was converted into a house boat. Following a storm she was severely damaged and was deliberately sunk to slow deterioration. 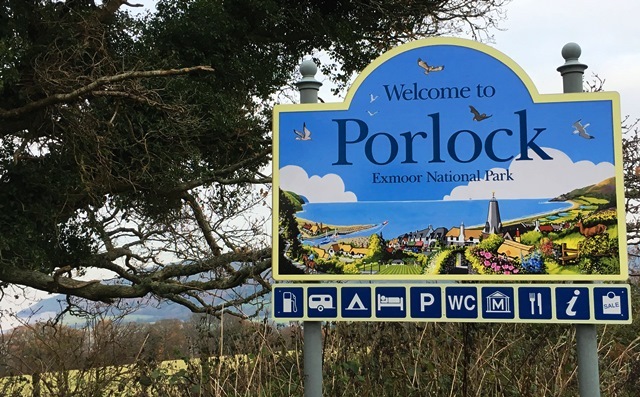 Eventually a group of enthusiasts, local benefactors, the National Trust and sponsors raised enough money to have her restored and she was relaunched in 1980. She now steams quietly around the lake, running on environmentally-friendly fuel logs and is admired by all who see her. 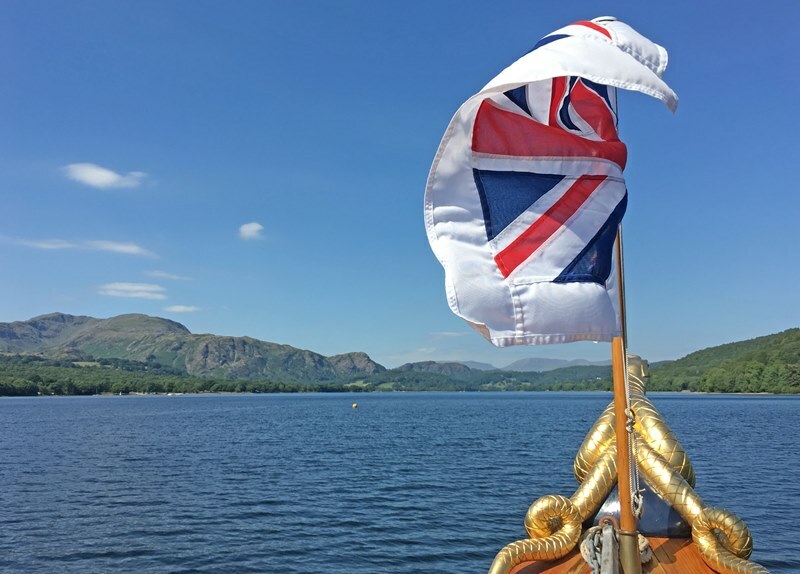 I spent a long time sitting at the front of the yacht, taking photos and admiring the sinuous snake adorning the bow (symbol of the Cavendish family) and fluttering flag as we sailed past mountains, impressive houses, people swimming and messing about in boats. The interior of Gondola is as stately as her exterior. The comfortable saloon, great for escaping the heat (or rain) is reminiscent of Victorian elegance with seats upholstered in red velvet and large windows to enjoy the impressive views. Old photos show Gondola in her heyday. I had a peek into the Engine Room, all gleaming copper and pristine paintwork; you can book an Engineer for the Day experience and learn how to light the boiler and raise steam. Bill invited me to join him in the wheelhouse, from where the views were even better. I even had a go at the helm, endevouring to keep us on a straight line. 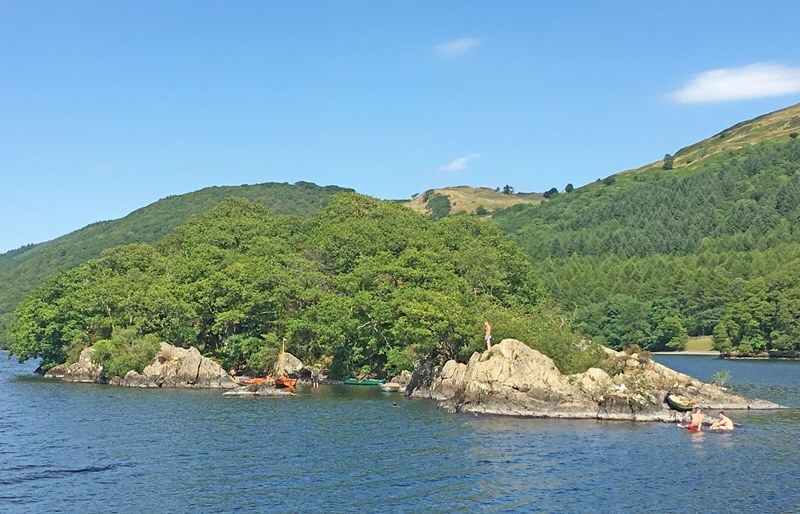 Writer Arthur Ransome spent many holidays staying with a family on the shores of Coniston and was inspired to write his Swallows and Amazons books here. We passed Peel Island aka Wild Cat Island and Bill pointed out the tiny ‘harbour’ and rocks from which young lads were leaping. Throughout the trip, Bill told us about Donald Campbell‘s doomed attempt to break the world water speed record and pointed out the yellow buoy, marking the spot where he went down in Bluebird. On such a glorious day, with the Old Man of Coniston looking benign in the sunlight, it was sobering to contemplate such a dramatic scene. I visited the Beatrix Potter Gallery and sailed on Steam Yacht Gondola as a guest of the National Trust in the Lake District. They looks after England’s highest mountain, its deepest lake and over 20% of the National Park. 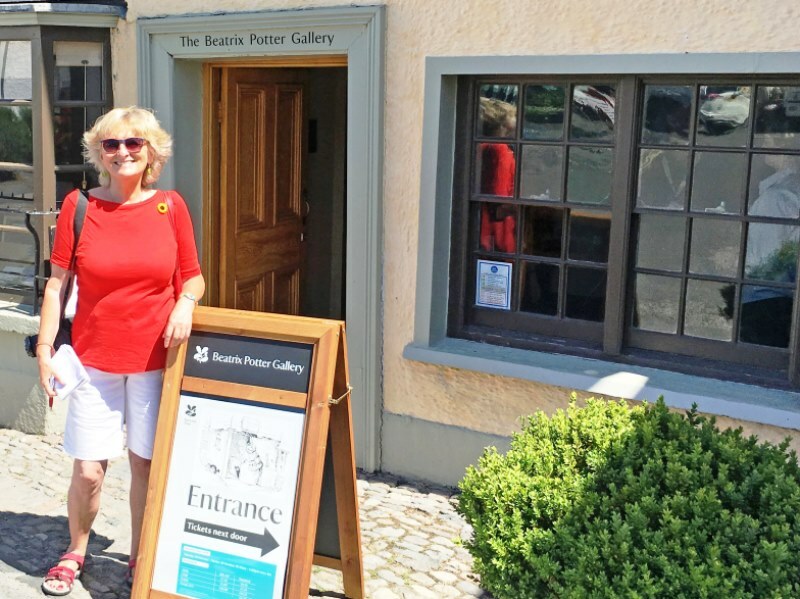 Entrance to the Beatrix Potter Gallery Hawkshead is free for NT Members. Gondola is operated by National Trust; NT members have to pay for tickets, but a 10% discount is available on all Head of Lake and Full Lake cruises. 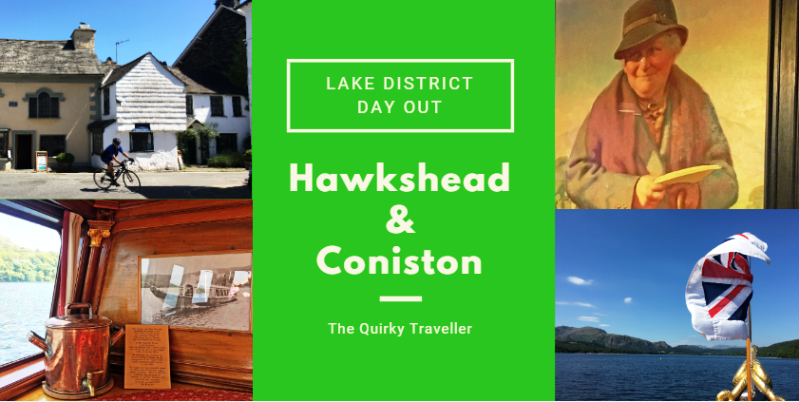 Hawkshead and Coniston are a perfect duo of places to visit in a day. 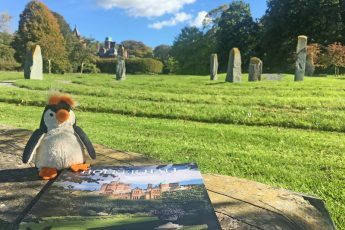 There’s so much to see and do in the Lake District but I’d recommend just visiting a small area rather than trying to see too much in one day. Although it is a relatively small area, roads are often busy and it can take quite a while to get from one place to another.